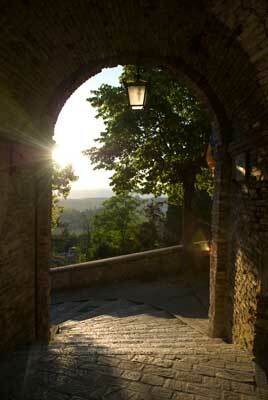 2) the Percorso Francescano, which cuts in half the valley in the segment Città di Castello – Pietralunga – Gubbio. 3) the “Dragon’s trace”, which connects the main monuments of the valley: the Pieve de’ Saddi and the Rocca d’Aries. 3) the Wild Animals Recovery Center – Centro Recupero Animali Selvatici (C.R.A.S. – in progress). and the astronomical observatory of Borgo Coloti. From Caimorone, bearing left through Casaprete and Montescosso, you quickly arrive at Pieve de’ Saddi. At this point, you will be halfway. It is recommended that you stop and get water, but also because you have the chance to visit the ancient Early Christian structure of the Pieve di San Crescenziano. You continue on the left side of the dirt road and descend to a small votive niche; from here you can climb to Calafuccia, the highest site of the path (638 meters). Walking down through woods and cultivated fields you will arrive at the Carpina. Arrived at Caigisti, you turn left and go up for about three km to the property of Caigiangi. From this point, you meet the paved road which runs up to the crossing with the county road to Città di Castello. You turn right toward La Madonnuccia and after a descent of about one km and a short rise, you reach Pietralunga: this other Altotiberino centre preserves its medieval aspect intact, with the walled hamlet, the “vigoli”, the parish church and the pentagonal Langobardic Fortress (VIII sec. ).